Have you ever bought some gorgeous yarn that’s in a hank instead of a ball and asked yourself “How am I going to wind this into a ball”? Obviously, you can’t crochet or knit something with the yarn if it’s in a hank and not a ball or it would tangle uncontrollably! I bought some gorgeous lace weight bamboo yarn at the CGOA Conference in Manchester, NH this year and decided I’d better wind it into a ball so I can use it sometime soon. I love the colors that are in this yarn, don’t you? 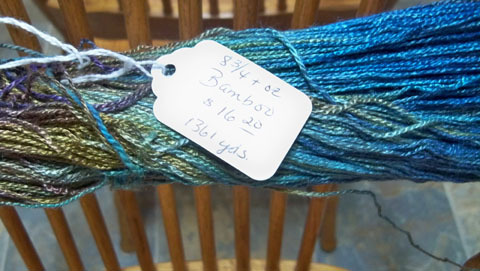 This yarn was sold by The Fiber Studio LLC in Henniker, NH. I think the yardage is great for the price and the fiber content (1,361 yards of hand-dyed bamboo yarn for only $16.20)! Anyway, I should have plenty of yardage to crochet something gorgeous, after I decide on the perfect item to make/design with it. I can’t wait! 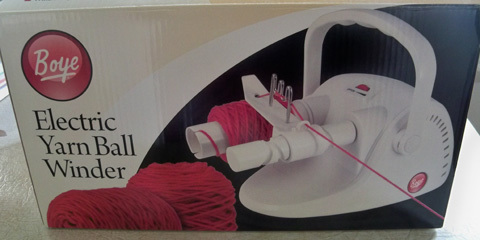 This electric yarn ball winder is available from many websites and at some local craft stores. You can watch a demo video of this yarn winder on YouTube here: http://www.youtube.com/watch?v=Yt83Fui5rDA. There was another 1 or 2 strands of yarn/thread tied around the hank that I removed, also. 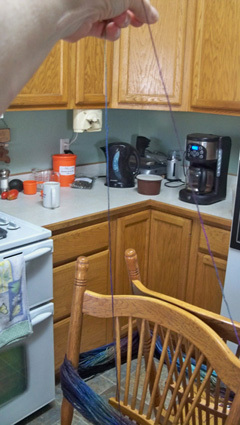 Then I started winding the yarn with the electric yarn ball winder. 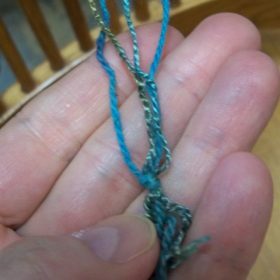 Since this yarn is somewhat slippery, I had to tie a knot in the end (to keep it from slipping off) before placing the end into the groove in the center of the yarn ball winder! Now a real yarn swift would have rotated and done most of the work for me, but I don’t own a swift, remember! 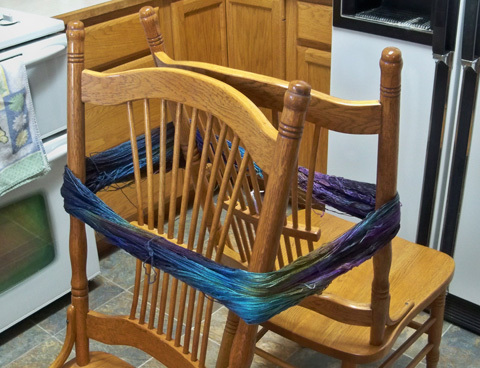 So I had to become a “human yarn swift” and guide the yarn above the chairs (because obviously, my chairs don’t rotate)!!! I got a bit of a shoulder and arm workout but not too much! It took me quite a while to wind the yarn, but it was definitely worth it. Now I’ll be able to use this yarn when I have an idea of what it wants to be (and when I have the time to devote to this project)! Doesn’t this look nice and neat? 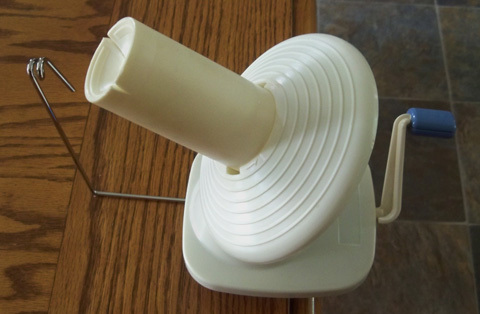 This electric winder really does a nice job. I can pull the yarn from the center or the outside of the ball, whichever I choose. If you use another method to wind your yarn into nice, neat balls, please share it with all of us here at The Crochet Architect! 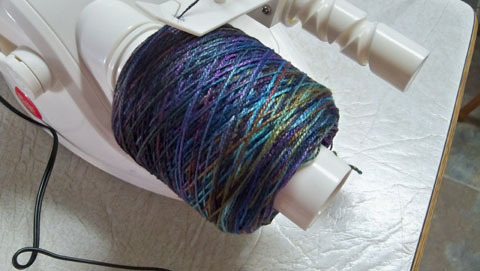 Or if you own an electric yarn ball winder, let us know how you like it! 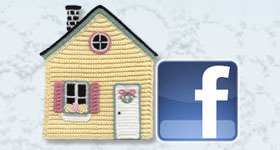 This entry was posted in Product review, Yarn review, Yarn winding and tagged winding yarn, yarn. Bookmark the permalink.